Making grammar and punctuation errors in your articles, white papers, and case studies leave a bad impression on your audience. As will also affect your company reputations and your own abilities will leave you in a bad situation. It was a long time back when one of my friend blog post was published and he was getting comments from the visitors. They were finding grammar and punctuations mistakes in his articles, which made him really frustrated. So he started outsourcing his content to a freelancer for proofreading. But it was expensive for him to get each post to get approved by the proofreader before he publishes on his blog. So one day he just came to my office asking for a solution, whether he should buy any application which would have cost him good hundreds of dollars. After doing some research of products which is available online, I found a good list of the best free grammar and punctuation checker tools online. I shared those tools with him and he was happy and started using Grammarly for his content. So let us check some of the best punctuation checker tools which are available free. Grammarly is one of the best grammar checker tools and is used by professional bloggers and big corporate house. Grammarly includes a punctuation checker, sentence structure checker, and grammar checker. It also includes plagiarism checker and vocabulary enhancement tool. Grammarly will not just check your content in word but it will also check your emails and whatever content you are publishing through the browser. Grammary is a free tool and can be easy installed on google chrome and firebox. Once you install this tool you can also enable it on Microsoft word. Look at the below screenshot. Grammarly is used by many professional bloggers because it helps them to correct punctuations and other grammar issues. It also checks for plagiarism from its database of over 8 million web pages. 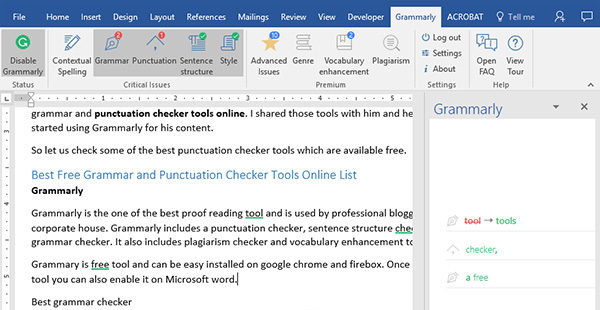 How to Install Grammarly in Word, Chrome, and Firefox. It is very simple to install grammarly in a word, chrome, and firefox. Visit grammarly website https://www.grammarly.com using any browser accept internet explorer. Because grammarly is available for chrome, safari and firefox only. Once you are on the home page of grammarly. Click on the button and download the extension. Run the setup, grammarly will be installed and will be enabled for your browser. Grammarly is recommended by top professional bloggers around the world. White smoke is yet another grammar and punctuation checker tool. Many ad agencies prefer to use white smoke for proof reading of their content.  White smoke premium plans offer contextual spelling checker, advanced grammar checker, punctuation and plagiarism checker and full text translator. I don’t like the interface of white smoke. But this can be ignored if you don’t care about it and focus on the content output only. You can easily install this tool on your browsers such as chrome, firefox, and safari. With just single click your content will proof read and apply the corrections. Ginger punctuation checker is also available for your android and ios app. So you can correct the punctuations on your messages as well. It features grammar checker, sentence rephraser and text to speech converter. The paper rater is free grammar and spelling checker tool. You can upload your file or paste your content directly. So you don’t need to download any application for using it. You can download this tool for free. If you are using wordpress for your blog or website. WordPress plugin is also available for punctuation checking. This tool features contextual spell checking, advanced style checking, and intelligent grammar checking. Language tool is open source program used by many content writers to get the result immediately on the screen. You have also an option to download this tool for chrome and firefox. You can copy and paste 10, 000 words in this tool for checking punctuation errors and spelling mistakes. Here comes another free punctuation checker tool. This tool also gives you the option to directly copy and paste content for proof reading. You can deep check for punctuation errors and spelling mistakes by using this tool on screen. It features spell check, grammar check, readability analysis, word density analysis and filer word analysis. All these features are free with just single click registration. No more complications just paste your content and get the results directly. Paste in your text and check for spelling and punctuation mistakes in your content. If you want your content standout, you have to make sure you don’t have any punctuation and spelling mistake. The first impression is the last impression – So turn your audience to regular visitors for your blog and website. This is a very nice list of programs to check grammar and punctuation errors. For my self I use grammarly, and I’m happy with it. Btw I’ll check some programs, that by ur description look awesome. Thanks Clay, I use grammarly for writing blog post and it really helps me in correcting punctuation errors and grammar mistakes. Great review, personally I use Grammarly to check grammar mistakes in my blog and Proofread Bot to check punctuation errors, spelling and grammar mistakes in my essays. But I’ll also try Gingerly, it seems to be rather cool. No matter how good are you in English. You are human and you would make a mistake. thanks to the developer of these tools who saved us many many times. Grammarly Rules the market. The best tool for English checker. You are bang on with your comment. Most of the content writers are using this tools for checking grammar and punctuation issues. This also save times on hiring additional resource for the proof reading. As this tools gives you notifications while you write the content. Mrunal and Dumaji, this is helpful stuff. Because even native speakers need help with grammar. Ryan Biddulph – Welcome to italkcool. Your comment added lot of value to our blog. I follow you blog daily and truly inspired from you. Even i would love to travel the world and work full time on my blog. BTW – People with less English knowledge can also become writer if you grammar punctuation checker tools. No matter how perfect we are in english, sometime mistakes can happen. So most of the professional bloggers used grammarly punctuation tool.